The first step to receiving financial aid for college is to apply for it, yet many students fail to do so. Why? Some believe they (or their parents, if they are still dependents) make too much money to qualify. Others are unaware that even half-time students can qualify for aid. Still others find the application process daunting. They hear acronyms like FAFSA and CSS and run the other way. Don’t be one of them. The process of applying for financial aid is actually pretty straightforward, once you have a bit of basic information on the most commonly required financial aid forms – FAFSA and CSS/Financial Aid PROFILE. If you’ve been wondering, “what is the meaning of FAFSA?” here is your answer: FAFSA stands for Free Application for Federal Student Aid. Federal student aid is made available by the federal government through the U.S. Department of Education. Federal student aid includes Pell Grants, Academic Competitiveness Grants, Stafford Loans, PLUS Loans, Perkins Loans, and Work-Study. 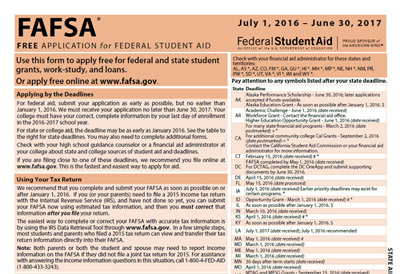 If you wish to receive any of these forms of federal student aid, you will need to submit a FAFSA application. What is the purpose of the FAFSA application? The purpose of submitting a FAFSA application is to give the Department of Education the information it needs to determine your eligibility for federal student aid programs. Eligibility for many federal student aid programs (particularly grants, subsidized Stafford Loans and Perkins Loans) is based on demonstrated financial need. The information you provide when filling out your FAFSA will allow for calculation of an EFC number. EFC stands for Expected Family Contribution. The lower the EFC number, the more aid you should qualify for. Who gets money from FAFSA? Most students who take the time to submit a FAFSA application will be awarded some sort of federal financial aid. Those with the lowest EFC numbers may have access to grants, that never have to be paid back, and Perkins Loans, that have very low interest rates. Those with higher EFC numbers may still qualify for subsidized Stafford Loans, where the government pays the interest while you are in school, or unsubsidized Stafford Loans, where interest accrues but you can defer payment until graduation. Some may even quality for federal Work-Study, a program that provides jobs to students to help them pay their education expenses. How do I submit a FAFSA application? It’s easy! You can actually submit a FAFSA online application and receive your completed SAR (Student Aid Report) within a week. You can submit your application online at www.fafsa.ed.gov. It is recommended that you complete the “FAFSA on the Web Worksheet,” also available on the government website, before you begin. This step will help to ensure that you’ve gathered all the necessary documentation and information so your online application can be filled out and submitted as efficiently as possible. Is the FAFSA required for state or federal financial aid? The FAFSA application is required to determine eligibility for all federal student aid programs. The FAFSA is also used to determine your eligibility for other forms of student aid including those from your state or school. In addition to the FAFSA application, some states or schools require submission of a separate state financial aid form. In the context of financial aid, CSS stands for College Scholarship Service. The CSS Financial Aid Profile is the financial aid application service of the College Board. Many colleges, universities and scholarship programs with membership in the College Board utilize the CSS/Financial Aid Profile to determine student eligibility for non-federal student aid funds. If I need to, how do I submit a CSS/Financial Aid PROFILE? Your first step should be to talk to your college admissions or financial aid representative to find out if you need to submit a CSS/Financial Aid PROFILE. Some schools use the application to determine award of non-federal aid such as institutional grants, scholarships and loans. If you are told that you do need to submit the application, you can do so online at profileonline.collegeboard.com. Unlike the FAFSA application, submitting a CSS Financial Aid Profile is not free. Current fees include an $9 application fee and a $16 processing fee. Each additional college or scholarship program you send your results to will cost another $16 in processing. Where do I find CSS/Financial Aid Profile instructions? The CSS/Financial Aid Profile is more detailed than the FAFSA application in that it asks for more information specific to the institutions non-federal aid programs. Your college financial aid office can give you preliminary information on the types of information and documentation that will be needed to complete the online application. Mistake #1: Not filing at all. According to a study by Sallie Mae and Gallup conducted in early 2010, 24 percent of students never get around to filling out and submitting the FAFSA application. If you don’t submit one, you can’t receive any form of federal student aid. Unless you’re heir to millions, don’t make this mistake. Mistake #2: Filing too late. Financial aid for a given year is awarded on a first come first served basis. If you fail to file your FAFSA application by the filing date set by your college or university could result in an offer of less financial aid than you may have received had you filed on time. It is recommended that you file your FAFSA application as early as possible in January of each year. You may even estimate your income and tax information from the previous year. If you chose to use estimated information, you will need to amend your application after your taxes are filed. Do this as soon as possible. While it’s preferable to submit your FAFSA using your actual tax and income info, using estimated figures and amending later is definitely preferable to missing the filing date due to a late W-2. Mistake #3: Leaving a field or fields blank. This is a very common mistake. Every student must fill in every field on the FAFSA application. If a particular question does not apply to you, enter “0” or “not applicable.” Blank fields can lead to miscalculations and even application rejection. 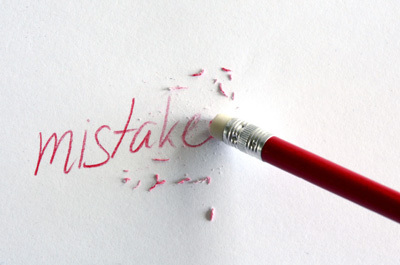 Mistake #4: Using the wrong name or social security number. This sounds like a silly mistake, but it happens. You must enter your legal name in the FAFSA application. This is the name that appears on your Social Security card. If you enter a nickname it will cause a processing delay. The same goes for entering your Social Security Number (SSN). Make sure you have entered your own SSN, not that of your parent. The best way to avoid mistakes such as these is to slow down and focus while filling out the FAFSA application. Mistake #5: Failure to sign the FAFSA application. If you’ve chosen to fill out and submit the paper version of the FAFSA, double-check that you’ve signed it before sealing the envelope. If you’re among the 98 percent of students who chose to use the more convenient online FAFSA, don’t neglect to obtain a Personal Identification Number (PIN) from www.pin.ed.gov. This PIN will serve as your electronic signature when filing the FAFSA online. You can correct mistakes on your FAFSA application after it has been submitted. However, this could create a two to three week delay in processing your application, receiving your Student Aid Report (SAR), Expected Family Contribution (EFC) number and subsequent award of financial aid by your college or university’s financial aid department. Taking the time to read the application instructions and submit your FAFSA correctly the first time is by far a better option.